A typical scatter plot allows you to compare the impact of one independent variable (x-axis) on one dependent variable (y-axis). Carpet plots facilitate trade studies between more than one independent variable. Imagine you need to deliver a number of items and want to know how much gas for the trip will cost. Total fuel cost is a function of the number of stops on the route. Let's import the required libraries and generate an example dataset. Now let's say we want to determine the total fuel cost as a function of two independent variables: (1) the number of stops on the route, and (2) the average distance between stops. For a range of numbers of stops and distances between stops, we can calculate each respective total fuel cost. First we can plot multiple lines, each representing one value of the second independent variable. For a simple dataset this might work, but it is difficult to visualize the trade-space in this manner especially with more complex datasets. We could also separate each of these lines into separate subplots, but there again we find difficulty making quick comparisons between each independent variable. We can get fancy and generate a 3D surface plot of our data. While pretty, this is even more difficult to read in a useful way if we are trading the two independent variables in an effort to converge on the dependent variable. At 17 stops and 24 miles between stops, how much will fuel cost? It's not easy to determine from this plot. The advantage of carpet plots is the ability to quickly visualize the relative impact of the two independent variables. This can be especially helpful when doing a trade study where multiple variables are in play. Pandas has a number of helpful data reshaping methods, and this exercise presents the opportunity to use pd.melt(). Our starting dataset is an array with the index of one axis representing the first independent variable values (stops), and the index of the other axis representing the second independent variable values (dist). The values in the array represent our dependent variable (cost). You can think of this as the output of an Excel data table, which may at times in fact be the data source. Plotly takes a list of each variable to plot a carpet plot, so we use pd.melt() to tidy this data and then convert to lists. Now that we have a tidy dataset in a list for each variable, we can plot using Plotly. Why Plotly? I have avoided Plotly in the past due to the confusing process of making an account and putting your plots online. But using Plotly's carpet plot example and some information from Stackoverflow, I was able to get it to work without the online authentication, which is just fine for a static chart. I would still prefer to use matplotlib, and may tackle that later. For now, here's the code to generate the Plotly carpet plot. Note that when running this, Plotly will generate a HTML file which then presents a prompt to save a .jpeg of your chart. 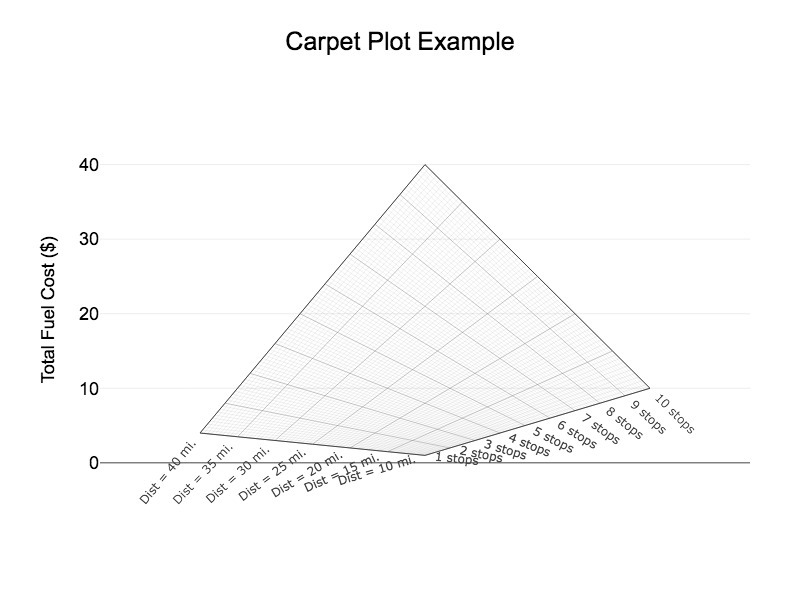 Great, a carpet plot! Now we can pick any combination of number of stops and distance between stops and easily determine the total fuel cost for the trip. This post was written entirely in the Jupyter notebook. You can download the original notebook.